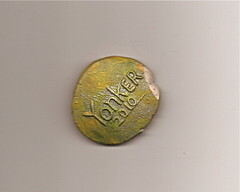 For more than 30 years now, sharp-eyed New Yorkers have been finding them on ledges, windowsills and store counters — poker-chip-size coins that reveal themselves to be something far more mysterious than loose change. The article appeared in the New York Times a few weeks ago, and it left me feeling both somewhat awed by Beriah Wall’s creativity and a little bit miffed. After all, I’m a sharp-eyed New Yorker. I’ve been in Brooklyn for years. Why haven’t I found — or at least spotted — one of Beriah Wall’s coins? Yesterday I was walking near the entrance to the Clark Street subway station when I noticed something gleaming on a low, shallow window ledge. 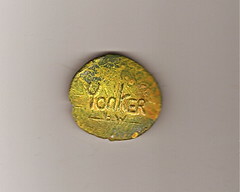 I thought it might be a metal button, perhaps even a large coin, so I paused and picked it up. It took a moment for me to recognize the object as something I’d recently read about: one of Beriah Wall’s token-like creations. A fragment was missing, chipped off at some point during its travels, but I tucked it securely into my pocket and am now enjoying this little found treasure. After a season of frigid winds, record snowfalls, bitter cold and torrential downpours, the last official day of winter brought a sudden, delightful change in the weather. The sun was bright, the sky was clear, the temperature soared to record-breaking heights, and winter-weary New Yorkers shed their heavy gear and headed outside. The area near the State Supreme Courthouse in Long Island City, Queens presented the contrast of bare branches and sun worshippers, both welcoming this preview of Spring. Resist though we might, sometimes New Yorkers are forced to leave the city. This was one of those days. I tried to make the trip out of town as short as possible and, when the weatherman predicted a fierce rainstorm, I made sure to get an early train back. It was before 3:00 pm when I boarded the New York bound train and settled in for a journey that should have lasted about an hour and a half. 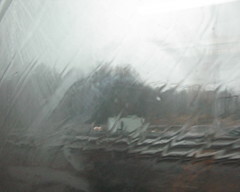 It was raining as we pulled out of the station, but the first couple of stops went as scheduled. Then, suddenly, the train stopped. A few minutes later, we started again at a slower pace. A couple more station stops and we limped along, gradually getting closer to the city. And then, just short of the Metro Park station, we stopped and – for quite a while – didn’t start. 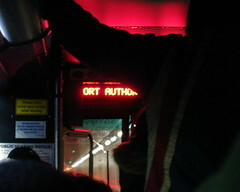 We waited and waited while the conductors announced (repeatedly) that we were being held. An hour passed, then two. I regretted my decision not to tuck a book into my bag. The passengers grew impatient, waiting for the answers that didn’t come, then turned to anger. I sat in the first car and listened as reports filtered forward, rumors that people at the back were smoking, that fights were breaking out. I stayed in my seat, pulled up my hood and feigned sleep. Gradually, we began to move again. Finally, we neared Newark, New Jersey. The train’s staff told us that our best bet was to get off and complete the trip to New York via the PATH train, a separate, rapid-transit railway system that transports commuters through century-old tunnels beneath the Hudson River. We left our train, paid an additional fare to enter the PATH system, and then stood on the cold, wet platform, waiting for a train. Any train. Nothing came. No one seemed to be in charge. There was no official to provide directions or information to the hundreds of people who crowded the platform. After about 15 minutes, we heard an announcement. The platform where we stood was “closed.” We were instructed to walk upstairs, to Track H, and wait there for a train. Finding the stairway meant leaving the platform, trailing behind furious people lugging heavy suitcases up steep, slippery stairways, and then … we were lost. We saw no signs indicating where Track H might be. Again, no one was directing us and there were no workers to ask. Weary, disoriented travelers walked up and down, through dripping passageways, while trying to avoid the aggressive beggars, clad in rags, who appeared at every turn, their hands outstretched. One of us finally spotted a sign to Track H. Up more stairs, pay an additional fare to enter, and we found ourselves on another cold, wet platform filled with people. Again, no officials were present to provide any instructions or information. The signs didn’t give any indication of when (or if) the train would arrive, or where it would take us. It didn’t matter. We just wanted to go. The minutes ticked by. 10. 15. 25. 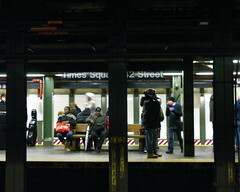 People continued to crowd onto the platform. Finally, a handful of policemen arrived and called out warnings, telling us not to stand too close to the edge of the platform. We ran to them, hoping for answers. When will the train come? When will we arrive in New York? We headed back downstairs, hoping that someone could direct us to a bus. We walked through the station, around the station, back and forth, asking everyone we saw until an astute girl pointed us to a bus stop beside the building. By the time we reached it, the waiting crowd spilled across the sidewalk and into the street. Again, no one was in charge. 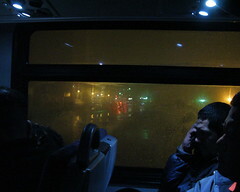 There were no announcements, no one controlling or directing the wet, tired, frustrated travelers, no signs indicating when the next bus would arrive or where it would go. After an interminable wait, a bus appeared and very, very slowly came towards us. When it stopped, the doors opened to reveal a police officer on board. The crowd surged forward, anxious to climb aboard, while the policeman shouted for them to refrain from pushing. 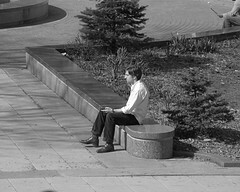 Few appeared to hear him, even fewer seemed to care. With dozens of people pushing from behind, it was impossible not to push forward. 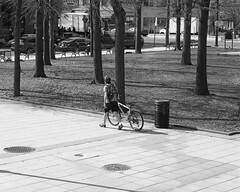 Try to stand still and lose your balance. Finally, the steps to the bus were almost under my feet when an unknown hand grabbed my backpack and yanked, hard. I stumbled and grabbed for the door. An old woman’s voice, commanded the person who’d grabbed my bag to “Let go, so I can get on this damn bus!” She pulled, I pulled, and the bag, still strapped to my shoulders, broke free of the grip pulling me backwards. I stepped onto the bus. There was one empty seat remaining. 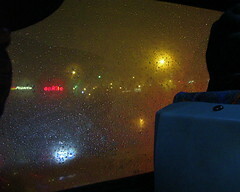 I sank into it and closed my eyes, hoping that this bus was heading to New York City. When the engine rumbled and the packed vehicle moved forward, I realized why the seat I’d claimed had been unoccupied; it was located directly below a vent and dripped cold water onto my head and shoulders. No matter. I wasn’t moving. 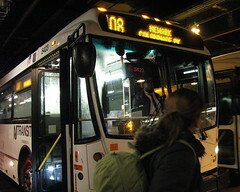 Our route, as it turned out, was to the Port Authority Bus Station in New York via Union City, New Jersey. 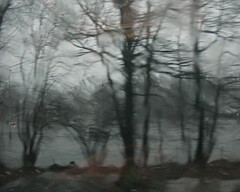 With the windows fogged up, the journey itself was a blur. 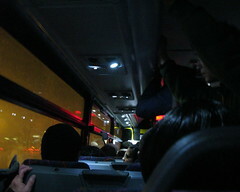 The lights inside the bus were dim, and through the windows I saw only watery glimpses of flashing lights, cars stranded on flooded roadways, the tiled walls of a passageway I guessed to be the Lincoln Tunnel. Perhaps the bus ride took about an hour; perhaps more. When I stepped into the warm, dry, cavernous space of the Port Authority, I felt like kissing the ground and vowing to never leave New York again. I hastened to the subway in Times Square, got the first train back to Brooklyn, and, just as the clock struck 10, I emerged in beautiful Brooklyn. According to the New Jersey Transit Web sites, in order to contact Customer Service about a refund, I must go back to Penn Station in person while their office is open. That will be a task for another day. 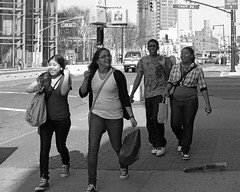 You are currently browsing the Blather From Brooklyn blog archives for March, 2010.